Twenty-six men arrested for protesting rumored holy site transfer to the Vatican; Holy See to visit the site in just a few hours. Jerusalem police on Sunday arrested 26 Jewish "extremists" protesting at King David's Tomb outside the Old City, which will be visited by Pope Francis, a spokesman said.The arrests took place just hours before Francis' arrival in Jerusalem. "Demonstrators at King David's Tomb threw stones and bottles at the security forces, lightly injuring two police," spokesman Micky Rosenfeld said Sunday. "Among those arrested was a soldier who threatened a police officer with his weapon when one of his friends was arrested," he added, saying some of them had broken into the room where the ancient sarcophagus is located before being evacuated. committed by the church against Jews during the Crusades and the Inquisition. Overnight, fifteen young men were arrested for barricading themselves to the tomb, in protest of the rumored transfer of the holy site to the Vatican. "This is a protest against the Pope's visit," they said. "The State of Israel is bending to the obsequious demands of those who represent a religion which has brought a lot of trouble to the people of Israel." "We want to protest against it," they continued. "Never forgive or forget the Crusades, the Inquisition and other Catholic persecutions of Israel." Police have implemented a crackdown on "Jewish extremists" in Israel, after the papacy has been up in arms over 'price tag' attacks, a euphemism for politically-motivated vandalism and criminal damage usually attributed to Jewish extremists, carried out either in revenge for Arab terrorist attacks, or in protest of Israeli government policies such as the destruction of Jewish homes in Judea and Samaria. Police have already stated that they will deploy an extra 8,000 officers in Jerusalem alone during the visit, in an effort to assuage Rome's fears. In addition, the Defense Ministry has already silenced at least one well-known Temple Institute official, Rabbi Yisrael Ariel, for organizing protests against the Vatican's involvement with King David's Tomb while the Pope is in Israel; several nationalists and others deemed "extremists" have been put on house arrest or arrested for expressing views condemning the papal visit. Controversy continues to reign over whether or not Israel has plans to transfer control of the site to the Vatican. Israeli officials have continuously denied an upcoming deal. The Minister of Public Security, the Chief Sephardic Rabbi and Israel's Ambassador to the Vatican have all denied the reports, which have claimed that there a secret deal between the Vatican and Israel on the issue. 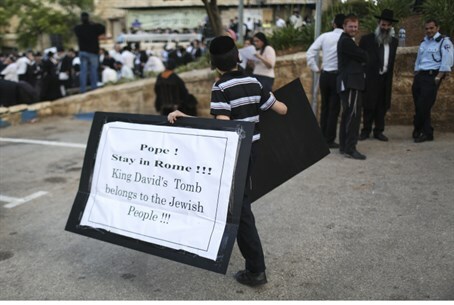 However, Rabbi Yaakov Sevilia, an activist for King David's Tomb, told Arutz Sheva that there is a deal in the works - which would see the Vatican gain more control over the Tomb, and give Christians greater right to pray there regularly. Several MKs and religious figures have also indicated that a deal is in the works, and have written strong letters to the Prime Minister's Office condemning the move and urging Israel to reconsider.